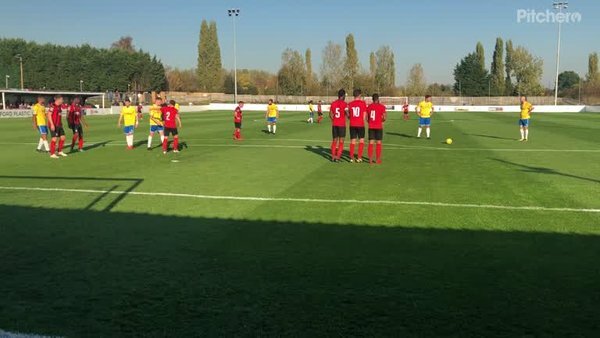 Canvey Island and Coggeshall Town played out an exciting 3-3 draw in the Bostik North at a sunswept West Street on Saturday. In a rollercoaster of a match on a superb playing surface, both teams produced some effective attacking football to put on a good show for the 148 in attendance. Manager Mark Bentley made one change from the side that beat Cray Wanderers in the FA Trophy last time out, bringing in new signing Jack Simmons on the wing in place of Josh Hutchinson who dropped to the bench. Canvey got off to the perfect start in fortuitous circumstances, taking the lead in the 8th minute. Coggeshall right back Tyler Brampton ignored the call of James Bransgrove, heading the ball over his own keeper and presenting Frankie Merrifield with the simple task of nodding into an empty net from six yards. The Gulls had further chances in the opening 20 minutes, with Martin Tuohy having a shot from the right saved by Bransgrove before James White had a header from a corner kept out from a similar position. They doubled their advantage on 32 minutes when a typically determined run from Jack Simmons saw him fouled five yards outside the penalty area. James White dummied the free kick for Martin Tuohy to strike, with the striker curling a right-footed effort through the wall and past James Bransgrove who was rooted to the spot. Coggeshall’s first site of goal came on 38 minutes when they were awarded their first corner of the match. The ball fell to the feet of defender Jamie Shaw who took a touch before lashing a shot towards goal which clipped the outside of the post. The hosts pulled a goal back on the stroke of half time in controversial fashion. With Jake Jolliffe shepherding a bouncing ball back to goalkeeper Harry Palmer, forward Sam Bantick pushed the defender in the back on the edge of the area. The push caused Jolliffe to collide with Palmer, with Bantick clipping the loose ball home into an empty net. Neither the referee or his assistant saw the push and the goal was awarded. Canvey had an opportunity to restore their two-goal cushion on 63 minutes when Coggeshall defender Dexter Peter took a swing at a long ball forward. Peter only got a slight touch on the ball which played it into the path of Martin Tuohy, but goalkeeper James Bransgrove did brilliantly to claim the ball at his feet as the striker attempted to round him. Coggeshall drew level five minutes later when Tyler Brampton played the ball across the edge of the area from the right for Nnamdi Nwachuku. The substitute side stepped Alex Stephenson before curling home a fine effort from 20 yards. The Gulls were back in front in spectacular style less than sixty seconds later when Sam Collins unleashed an unstoppable shot from 30 yards which flew into the top corner to add to his tally of remarkable goals in a Canvey shirt. This topsy-turvy match found itself all square once again with ten minutes to play when the ball was played into the feet of Sam Bantick. The forward did well to turn, take a touch to create space and fire an accurate shot across goal and into the bottom corner. The hosts could have won the match in the final minute when a corner was punched by Harry Palmer. The danger wasn’t cleared however and gave defender Dexter Peter a great chance to score, but his header at the back post from eight yards went over a largely unguarded goal. Canvey were forced to finish the match with ten men when centre back Alex Stephenson was forced to leave the pitch with a shoulder injury.